Electric Vehicles (EVs) offer a zero vehicle emission alternative to the combustion engine. 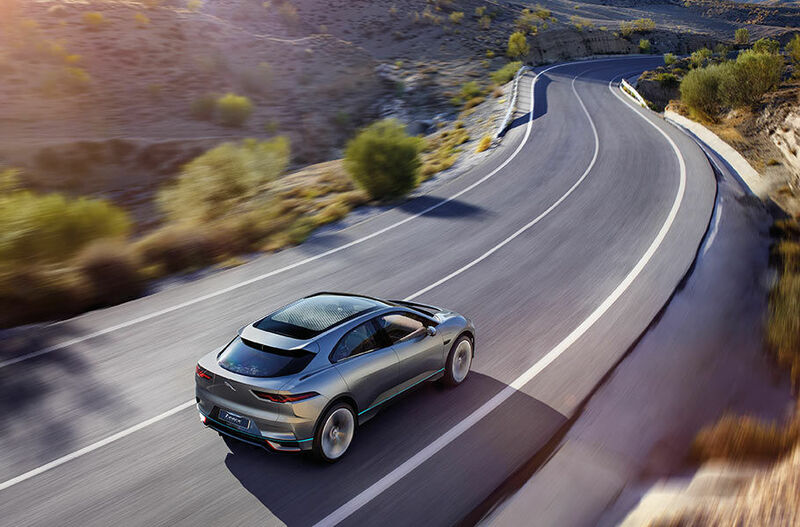 Thanks to recent investment and advances in battery technology, the next generation of EVs, such as I‑PACE Concept, deliver a thrilling new driving experience. What type of electric vehicle is I‑PACE Concept? I‑PACE Concept is a Battery Electric Vehicle, which means it has no combustion engine. Instead of burning fuel (petrol or diesel), power is supplied to two electric motors in the form of electricity stored in rechargeable batteries. Why would I want an electric vehicle? For many this an exciting opportunity to be one of the first people to move to electric vehicles and to enjoy a very different driving and ownership experience. I‑PACE Concept is a smart choice – a faster, spacious, refined (quieter) drive with no need to visit a fuel station again. With electricity supplies increasingly being delivered from renewable sources, electric cars offer environmental benefits over traditional fuel-burning engines too. This is increasingly being recognised by governments around the world with the availability of a wide range of incentives to reduce purchase costs and company car taxation. This, together with the reduced running costs of an electric vehicle, create a compelling financial case for many people. What are the drawbacks of owning an electric vehicle? The range of an electric vehicle (the distance that can be travelled before having to recharge the battery) has traditionally been a concern for many people, giving rise to the term ‘range anxiety’. However, the latest developments in battery technologies mean that vehicles such as I‑PACE Concept are now a realistic proposition for most people, with a range in excess of the average commuting distance. In fact, many people will find that they may only need to charge the battery once a week. For longer distances, a stop may be necessary to recharge the battery. This may require some advance planning, but continues to become easier as public charging networks continue to expand and rapid chargers increase in power. Are there other types of electric vehicles? What is the difference? You may have heard of the term ‘Hybrid’. This refers to a vehicle that combines a combustion engine with an electric motor. A Hybrid Electric Vehicle (HEV) typically has a small battery that is charged by the engine and regenerative braking, and has a very small electric-only range. A Plug-in Hybrid Electric Vehicle (PHEV) can also be charged from an external source of electricity. A PHEV typically has a larger battery and longer range than a HEV. These ‘hybrid’ vehicles offer a smaller electric-only range than Battery Electric Vehicles, but can continue to run without access to electricity. By carrying two power sources they are heavier than conventional cars and not as efficient as Battery Electric Vehicles. They can reduce ‘range anxiety’, particularly while charging infrastructures continue to develop and can support the transition to an all-electric future. Will an electric vehicle have enough range for my journey? Modern, premium battery electric vehicles, including I‑PACE Concept, can have a range of over 500km*. So range won’t be an issue for most drivers, especially with a growing public infrastructure of charging points. Range can be affected by many factors. For example, range will be reduced if you are driving in high or low temperatures, if you are operating the heating or cooling systems, or if you engage in performance driving. In extreme, long-lasting heat the vehicle’s range is reduced because energy is required to cool it down. Similarly, when temperatures are low, range is reduced because energy is needed to warm up the battery. Batteries can be stored as low as -40°C, but must be plugged in and heated to -20°C before driving. Next generation electric vehicles, such as I‑PACE Concept, feature state-of-the-art thermal management systems to optimise battery life in warmer or cooler temperatures. Kilowatt-hours is a measure of how much energy can be stored in a battery. For a given vehicle, a battery with greater capacity – more kWh – will have greater range and/or performance. I‑PACE Concept will offer an industry competitive battery warranty. Home charging using Alternating Current (AC) supply: Electric vehicles can be plugged into a normal domestic socket, but will charge at a fairly slow rate. For this reason, it is recommended to use an upgraded socket (for example, as used for an oven) or, better still, to install a home charging wall box. Charging times depend on your country but typically, I‑PACE Concept can be fully recharged overnight using a wall box. Public Charging: A growing network of public charging points can also be used to recharge, typically to top up the battery during a journey or at a destination. These charging points operate at a higher power than domestic chargers, therefore charging times can be lower. They provide a mix of AC and DC (Direct Current) charging, with DC charging typically being the fastest option (often referred to as ‘rapid charging’). For convenience and speed of charge, a wall box is recommended (but not essential) in order to charge an electric vehicle at home. Installation costs vary by market (and electricity supply) but are affordable and continue to fall in price as take up increases. Mode 2 universal cables are generally standard fit on electric vehicles and come with different adaptors and plug variations to meet global standards. They are supplied with both domestic and industrial socket options. Not necessarily: this depends on a number of different factors. There is a growing network of public charging points, with both standard and fast charging points available. In cities and on major roads, there are also many ‘journey’ and ‘destination’ charging points provided for your use. These convenient charging stations can be found at local shopping centres, hotels, ,gyms, etc. Rapid charging can be found at service stations or dedicated electric vehicle charging stations, providing the maximum charge in the shortest time. Safety of the charging process is fully assured. Customers and bystanders aren’t exposed to any risk of electric shock. How does the handling compare to ‘conventional’ cars? Due to the location of the battery in the floor between the two axles, electric vehicles have a lower centre of gravity and an even weight distribution front to rear for improved handling. Without the need to package a big engine, typically in the front, the wheels can be positioned nearer to the outermost corners of the vehicle enhancing stability and steering feel. All of this enables a dynamic and responsive driving experience, which makes an electric vehicle a perfect fit with the Jaguar brand. Are electric vehicles slower and less responsive than petrol or diesel cars? By their nature, electric motors generate maximum torque from standstill, creating stunning acceleration. I‑PACE Concept, like all other Jaguar vehicles, is designed and engineered to meet the most stringent global safety standards. Are electric vehicles difficult to maintain? Compared to a vehicle with an internal combustion engine, electric vehicles require less maintenance as they have fewer moving parts. In simple terms, there is less that can wear out. Service intervals are based on mileage and/or time. How much is I‑PACE likely to cost? Final pricing will not be confirmed until closer to the launch of I‑PACE. Whilst electric propulsion systems can be twice as expensive as conventional systems, we assume I‑PACE will be priced 10-15% above a similarly powered and equipped Jaguar F‑PACE. Keep up to date with the latest news in advance of I‑PACE’s full reveal in late 2017. Want to be among the first to own I‑PACE when it becomes available in the second half of 2018? Let us know and we’ll put you in touch with your nearest retailer. All figures for acceleration, power, speed, range and charging are manufacturer’s estimates on best information available at publishing. Production vehicles will be tested and certified prior to release, with official figures available prior to any customer order. The I‑PACE Concept reveal, images, descriptions and pricing are presented in good faith to indicate the exciting prospects for the production vehicle. JLR reserves the right to vary, amend or withdraw any element in the interim (prior to any binding customer orders), in particular but not limited to circumstances arising from legislative or regulatory changes, intervening material market influences, and production or in-service demands relating to the production vehicle or its functions and components. For full terms and conditions, please click here.